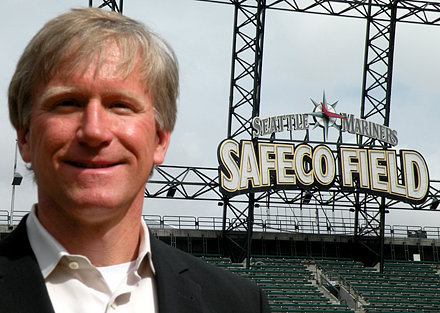 As Vice President of Operations of the Seattle Mariners, Scott Jenkins is out on the front lines of their entire operations system—reducing waste, increasing efficiency and making investments that meet the triple bottom line (addressing people, planet AND profit). He and his team saved the Mariners organization $1.2 Million over the course of just four years through energy efficiency and waste reduction alone—not too shabby. Jenkins is also spearheading the Mariner’s involvement in the Green Sports Alliance and will be speaking on behalf of the organization at the Green Sports Alliance Summit this August. We sat down with Scott to talk shop on how he was able to make such significant impact in a short period of time and what lessons he’ll bring to the Summit to share with his fellow sports professionals. Social Enterprises: How did the Mariners get involved with the Green Sports Alliance? Why does your organization feel it’s important to be involved in the early wave of collaboration with the industry? Scott Jenkins: In the fall of 2009, Jason Twill from Vulcan Development (Paul Allen’s development company) reached out to Dr. Allen Hershkowitz of the Natural Resources Defense Council (NDRC) to discuss the greening of the Sounders, Seahawks, and Trail Blazers. Allen suggested including me in the discussion. Allen and I worked together on the Philadelphia Eagles “Go Green” program shortly after Lincoln Financial Field opened in 2003. As we planned our first workshop, it became apparent that we shouldn’t stop there, so we soon invited the Storm and Canucks. We’ve been meeting quarterly ever since and have expanded the concept to include any professional team and venue which has spawned the Green Sports Alliance. I’ve seen the progress that MLB has made where we tripled the amount of recycling being done in just 3 years. Similar opportunities exist in conserving energy and water as well as dealing with supply chain issues. It all starts with metrics. Immediate results followed once we started tracking and sharing data. Benchmarking performance of our peers and sharing better practices is key to driving change. The Green Sports Alliance is simply an extension of that thinking. The biggest opportunity we have is the potential to influence the public through our brands and venues. We’ve got to make it cool to conserve. It’s been just the opposite for fartoo long, and I believe a growing sector of the public is starting to come to this realization. The Green Sports Alliance provides a huge opportunity to improve our operations but more importantly influence the public. How could you pass on that opportunity? SE: How are sports teams particularly suited to promote sustainable, responsible community citizenship? SJ: CSR (Corporate Social Responsibility) has been a big part of professional sports for a long time. Greening sports is relatively new to the mix but increasingly important. We can use our brands and iconic venues to get people to think about what they can do at work, at home, at school, and at play to lead the kind of behavioral change in society that’s needed to begin addressing the environmental issues we face. SE: Your rate of recycling has increased substantially in recent years. A lot of people tackle waste because it seems like a low hanging fruit, but are you seeing benefits from a profit standpoint? Are your efforts saving the Mariners money? SJ: Fortunately for us, we’ve been able to make the business case for it and there are a couple of ways we’ve done that. One concerns the sheer cost of getting rid of the waste. For us, it costs less to recycle than it does to send something to the landfill. So last year, with an average diversion rate of over 70 percent on waste, we saved about $70,000 just by recycling. That’s a pretty good business case. Now that changes based on where you live and what it costs to send things to the landfill, but we’re able to benefit from the fact that we’ve seen growth here in terms of facilities that can handle our compostable waste in an economical way. So it makes direct bottom line sense for our club to do that and it also greens our brand—which ultimately makes bottom line sense as well. SE: Did waste seem like a natural place to start? Or did you go through an analysis and strategic planning process of some kind? SJ: It started with data. Fortunately, before I came to Seattle, the data was being kept on energy and water use and recycling rates. So I had the numbers in hand. When I first took a look at the baseline, I immediately saw room to get better from what we’d done historically with those three areas—energy use, water use and recycling. The first year, I looked at the resource use and thought we could save $100,000 in year one alone if we considered what we’d used in the first six or seven years of being in the building and stuck to a goal of keeping to the low end of usage at all times. We found that $100,000 of savings in the first six months and ended up saving around $274,000 in that year compared to the previous one. After that it became pretty obvious that there were some tremendous opportunities to save money by being more efficient—turning off equipment, using automation, setting back temperatures, decommissioning equipment once the season was over, weather stripping and faucet aerators—without actually investing any real money. I knew we were on to something pretty big. SE: Do you see non-professional sports teams (i.e. colleges and high schools) benefitting from your model of waste reduction and efficiency? SJ: Absolutely. I even see the Green Sports Alliance influencing the kids soccer game, local swim meets and little league games too. What kid doesn’t look up to professional athletes and teams? We represent the pinnacle of athletic performance and there’s no reason we can’t do the same for environmental performance. SE: Do you think instituting sustainable practices at work affects the organization? More than influencing the fans, do the ballpark employees and the players benefit? SJ: Yes. Our efforts in reducing environmental impacts have provided a sense of pride and accomplishment to a wide range of employees. We celebrate the fact that we now recycle 80 percent of our waste and have reduced our natural gas use by 60 percent and electric use by 30 percent. Employees are engaged and involved in making a difference. The ballpark is also a healthier workplace due to the benefits of adopting green cleaning practices. Now, if we could only get everyone walking or riding their bike to work—we’d do the planet a big favor and need fewer trips to the gym to stay in shape. 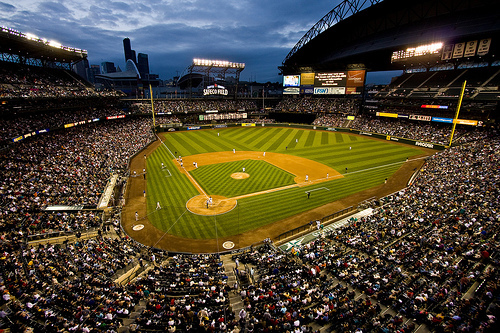 Scott Jenkins is the Vice President of Ballpark Operations for the Seattle Mariners baseball team. He’s also a founding member representative for the Green Sports Alliance and featured speaker at the Green Sports Alliance Summit, August 1-3, 2011 in Portland, Oregon. For more information on the Green Sports Alliance Summit, please visit: http://www.greensportssummit.org.